The use of rhizomes and roots of Valeriana officinalis for treating sleep problems dates back to 1000 years. The FDA has also deemed this root as GRAS (Generally regarded as safe) and approved of its use as a daytime sedative. Valerian root contains valepotriates, valerenic acid, and unidentified aqueous constituents that give rise to sleep inducing and tranquilizing properties. Many clinical studies showed that 400-900mg extracts of Valerian root taken before bedtime improved the quality of sleep in insomniacs. This property makes it one of the best natural remedies for insomnia. Another popular treatment for insomnia is the use of Ginseng which has been used medicinally for more than 2000 years. There are many sub species of Ginseng-American, Korean, Asian etc- and they are all known for their sleep inducing and sleep modulating properties. Recommended daily dosage is 200-600mg extracts or 1-2g of crude root. Do not use this herbal aid for insomnia for more than 3 months. Kava Kava is a shrub local to the islands of the Pacific. It contains a group of resinous compounds called Kava lactones and kava pyrones. Studies conducted on these in animals showed relaxed muscles, sedation and anti spasmodic activities that all help induce sleep. Short term clinical tests on humans have also shown that Kava Kava can effectively treat anxiety and insomnia in humans. As a herbal sleep aid, you can take up to 180-210mg of Kava Kava daily. Passion Flower contains active compounds including alkaloids, ethyl maltol and flavonoids. When administered to rats, the extracts of passion flower induced sleep and also prolonged sleeping times. Usual daily dose is 4-8g can be taken in form of tea. While no side effects of this natural insomnia treatment have been reported, the compounds in Passion Flower could harm pregnant women. Therefore this sleeping herb is contraindicated in pregnancy. Dried hops are popular sleep aids that are completely natural. In the past, dried hops were used to treat intestinal ailments but recently, its use as a natural and safe remedy for sleep has enabled it to find its way in herbal teas, extracts and supplements for natural insomnia treatment. Hops contain volatile oil, Valerianic acid and estrogenic substances. Tests on animals and humans have show sedative and calming effects. When taken as a tea, the herb induced sleep within 40-50 minutes. Recommended dose for Hops for insomnia is 0.5 grams of the dried herb or equivalent of its extract taken 1-2 times a day or as recommended by an herbalist. Even large doses of hops as a natural remedy for insomnia have been well tolerated. That being said, pregnant women must avoid this herb as remedies for insomnia owing to its estrogenic properties. Chamomile is one of the most popular ‘sleeping herbs for insomnia’. Both German and Roman Chamomile have been studied for its sleep inducing properties and they are mainly known to contain essential oils that give sedative and anti-inflammatory effects. You can safely take Chamomile extracts at 400mg/kg body weight in the form of tea, supplements etc. You can even use chamomile essential oils on the pulse points to induce aroma therapeutic effects. Make sure you are not allergic to the essential oils by first conducting a patch test. If you do not experience any adverse symptoms like itchiness, redness, etc, you can safely continue to apply Chamomile oil. A few drops of the oils can also be placed on a handkerchief or directly on the pillow as a natural sleep aid for insomnia. When taken internally, Lavender as a herb to aid sleep helps alleviate anxiety and pain to let you sleep longer and better. It is proven to ease feelings of tension, stress and muscular aches that all give rise to insomnia. Add a few drops of Lavender essential oil to your pillows or on your feet at bedtime. If you are using highly concentrated Lavender essential oil, do not directly apply to the skin but dilute it first with carrier oil like Sweet Almond oil or fractionated coconut oil to prevent allergies. You can even use 3-4 drops in a diffuser. 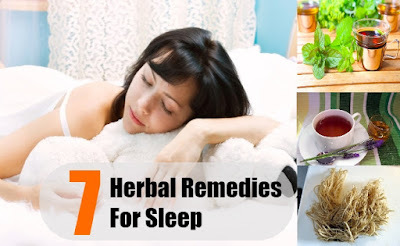 Pregnant and nursing women must exercise caution when using any of the herbal remedies for insomnia described above.